Part of our program includes innovative Empowerment Workshops for adults where they learn the life changing skills that will help them to take control of their situation and break the cycle of homelessness for their family. During these workshops our CHILDCARE ROCK STARS provide a vital service that allows many of these parents the freedom to attend these events. This is a rewarding opportunity where you can watch a child grow and thrive as well as helping a parent change their life! What’s the best thing about the new school year? Getting all the new supplies, of course! Help Families Together provide a fun and dignified way for kids in our community to pick out the tools that are going to help them succeed. We need volunteers to help manage the Families Together “School Store” where families come to “shop” for success. Volunteers will help kids pick out and pack up the supplies they need for the school year. Sometimes parents have multiple kids and they need help keeping all the needs organized. If you are the perfect person for this opportunity, here's how to get started! 1. Email volunteer@familiestogethernc.org or call 919.307.1892 to receive the volunteer start up kit and schedule a phone interview. 2. Once you are an approved PLMFT Volunteer, you can sign up for opportunities. We need volunteers to help set-up the Families Together “School Store” where families come to “shop” for success. Volunteers will help arrange and clean up our “store” space and help to put together packets and other resources to start the year off right! If you're looking for a rewarding on going volunteer opportunity where you can make a difference in a child’s day our After School Enrichment Program is for you! Our Child Mentor Superheroes help children staying in our Short Term Housing Apartments (STFA) with homework and provide activities that encourage independence and self- expression. 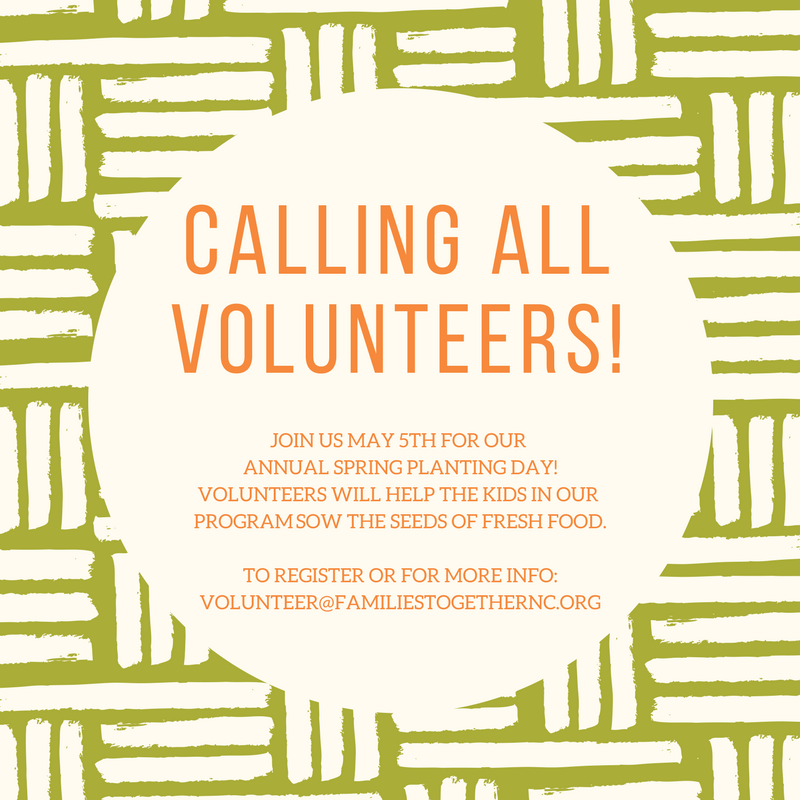 Families Together is in need of a few upbeat enthusiastic volunteers who want to work with kids of all ages to plant seeds and plants in our Community Teaching Garden. This is an opportunity to come together as a community to start the spring off with the promise of fresh healthy food for families in our program. You do not need to have prior experience, we will teach you all you need to know. Your time will give kids a chance to learn and grow as they experience the cycle of the food they eat. If you are passionate about kids, food or gardening this is the perfect opportunity for you! Teens needing community service hours for school.